One of the more unusual pieces at Upfest 2018 was this absolutely wonderful tile installation on the gates of the Tobacco Factory by Chinagirl Tile. As the years go by, her work becomes more and more ambitious, and this ceramic Giraffe is certainly the largest work I have seen from this Austrian (international) artist. The incredible giraffe is entitled ‘it’s a zoo up there’ was funded by the Austrian Cultural Forum London and BMEIA, and that got me thinking that her work must be rather expensive to produce and that funding and sponsorship must be an important factor in her ability to work. spray can artists probably don’t have the same kind of overheads. Unfortunately I don’t think I have been able to do this piece justice, mainly because when I took the pictures, the sun was directly behind it. I think this is a wall that needs photographing early in the morning or in the evening. If you look closely, you can see the individual tile sections that are placed together to make the whole. I guess this is for ease of modelling and firing as well as transportation. Another unusual feature of this piece is that the head of the giraffe is 3 dimensional, not a flat tile that one expects from Chinagirl Tile. I really love her work and am proud that she has chosen Bristol to play host to several of her pieces over recent years. One of the pleasures of writing about street/graffiti art and seeking out new sites is finding something there that you recognise. Feeling knowledgeable about something is very empowering and comforting, and we could all do with a bit of empowering and comfort from time to time. For me this happened when I saw this Chinagirl Tile piece in Leake Street just before Christmas. 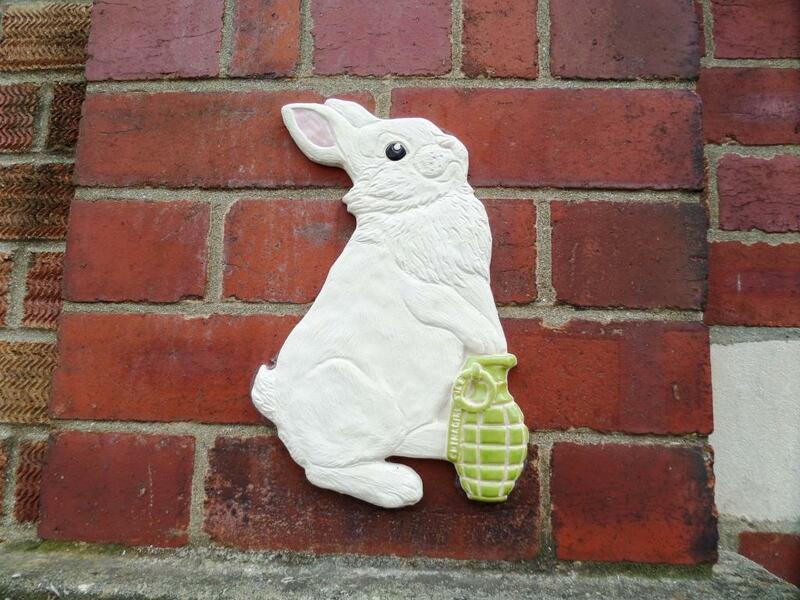 I have always had a soft spot for her work, and this very dangerous bunny is one of my favourite tiles she has produced. There is one in Bristol that I blogged about last year. I noticed that of the numerous ‘street art tourists’ who entered the tunnel from this entrance, none that I saw stopped or appeared to notice this rabbit, such was their eagerness to descend into the bowels of Leake Street. 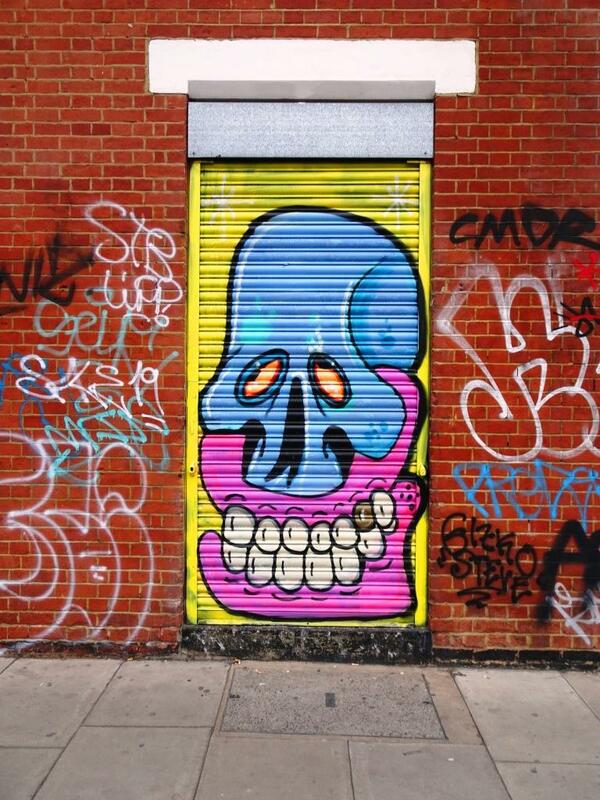 For me, street art is not just about the blindingly obvious, it is about subtlety, style, class and placement, much of which is lost on many people. This links to a theme I have mentioned many times in Natural Adventures, and that is that many of us look, but don’t see. Look harder and you might see a rabbit clutching a grenade. Watch out! OK, so I know I have already posted this cheeky little rat before, but that was in North Street and this one is in my favourite Leonard Lane. I really am a bit dense sometimes…it has taken me until now to get the joke. The reference in the piece to Banksy relates to his signature rat that he used in many of his early works, and there is me thinking this was a squirrel. Thick, that’s me. Chinagirl Tile really seems to get around Bristol when she comes for Upfest, which in my view is a pretty good thing. This rat is down the dingiest lane, the perfect spot for it, and will not have been seen or noticed by too many people. Still more to come from this brilliant ceramic specialist. 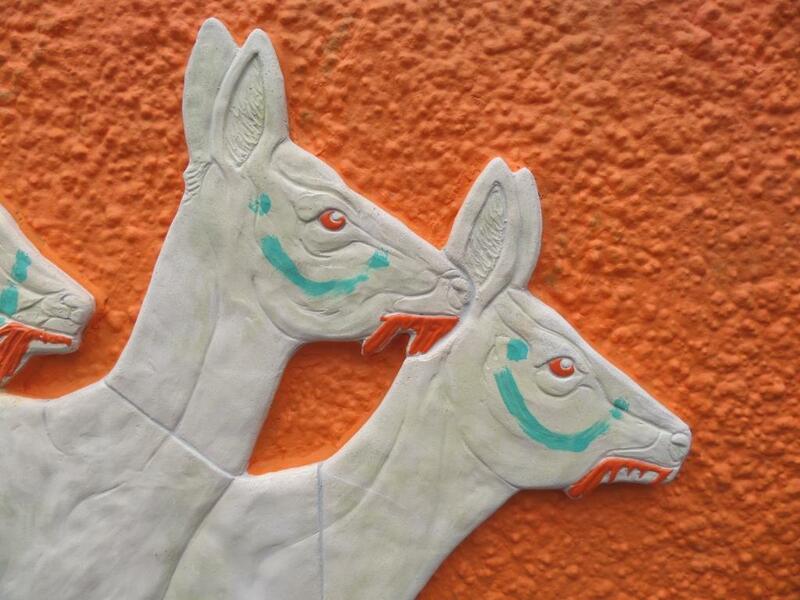 This wonderful group of radioactive deer is another ceramic delight from Chinagirl Tile that was left here on the eve of Upfest. I have said it many times before, but one of the biggest pleasures of Upfest for me is seeing an influx of new work from ‘out of town’ artists refreshing areas all over the city. 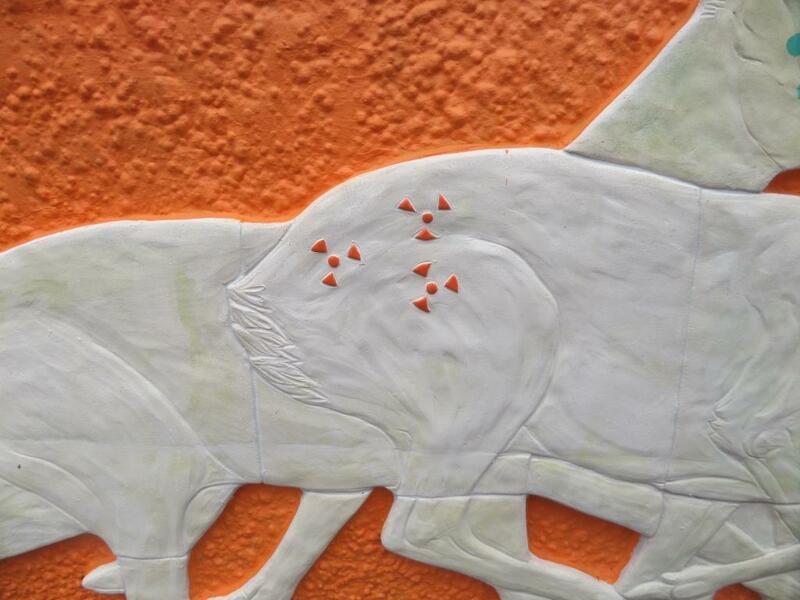 Chinagirl Tile told me about these deer at Upfest, and she said that the orange radioactive symbols on the deer rumps matched the wall, which was good fortune rather than design. As always from her work we have an uneasy edge between nature and humanity. Radioactive deer are threatening, where deer are endearing. The galloping movement instills a feeling of panic or fear. In my view this is a very powerful piece. 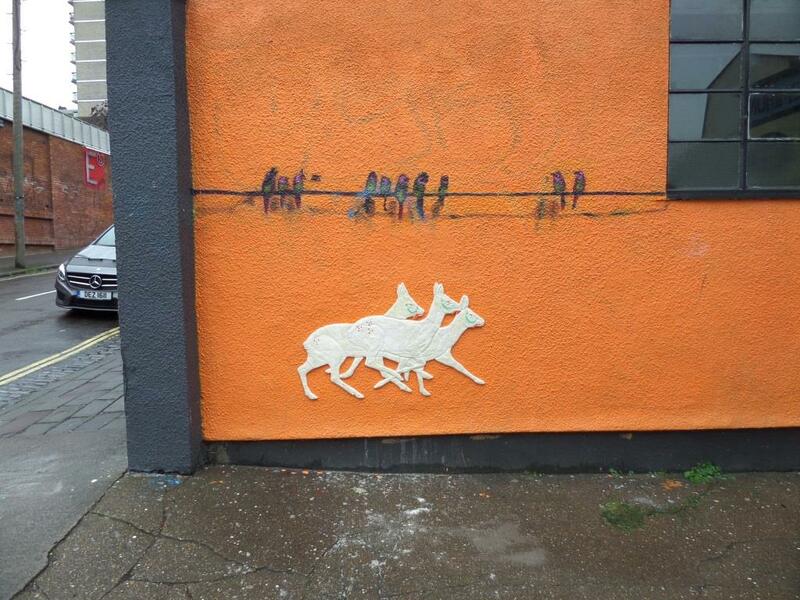 Unfortunately some scoundrels had already tagged this piece by the time I got to it with blue markings on the deer faces. Annoying, but fortunately not so destructive that the piece is ruined. This is a ‘must see’ piece for anyone visiting Bristol. I am a huge fan of China Girl Tile, and was so excited to hear that she would be at Upfest 2016. I had seen lots of her work on social media, but nothing in the flesh, so it was a real treat not only to see her at work, but to be able to say hello and stop for a quick chat. I caught up with China Girl Tile while she was finishing off her work in the drizzle on the second day of the festival. The wall she was working on is in the back yard of the Hen and Chicken and in really great company (Fake, Cosmo Sarson…and others). I am glad she chose foxes for this installation, because as many of you may know Bristol is famous for its urban foxes. In fact some research a few years ago showed that the most densely populated group of foxes on record were in and around my allotment. Their numbers fell due to mange and the introduction of wheelie bins with strong lids. I digress. I love foxes. Her reference to the Campbells soup tin is not only witty but is incorporated so very well into the unfolding story. Her work is unusual and refreshing and executed with such skill and dedication. The tiles are really beautiful and enchanting. Please can we get more China Girl Tile work in Bristol.